In honor of the World Series starting, I released a new Sporcle Quiz: Can you pick the World Series match-ups? It’s pretty difficult, but also a lot of fun. Also, as a follow-up on my 2016 Drought Report: it’s been a pretty good year. We got one of the sixteen possible World Series match-ups that had never occurred before, but that's just the start of it. The Cubs and Indians (1908 and 1948, in case you need a refresher) represent not just the two longest active championship droughts in the playoffs this year, but in baseball overall. In fact, in all of the North American sports leagues, the only way you could construct a longer combined title drought right now is if the Cubs somehow faced off against the Arizona Cardinals (naturally; who else would the Cubs face but a Cardinals team?) in what I only presume would be the World Championship of Calvinball. With a combined 174 years of drought between them, the 2016 World Series’ record is guaranteed to stand for a little while, because one of the two longest droughts is guaranteed to end. 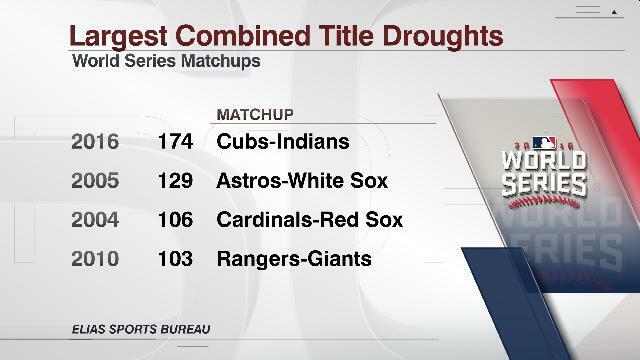 The Cubs (as of right now) by themselves automatically make any potential match-up third on this list. If they go, we’re going to need to wait for the Brewers, Padres, or Nationals to catch up. Each of those three is yet to win it all since being founded in 1969, tying them for second longest championshipless streak in the National League. If the Indians and one of those three were to not win until their combined droughts topped 174 years, we’d be waiting until the 2047 season. But even if the Indians triumph and leave us the Cubs’ drought, we’ll still have a few years with the record at minimum. The next possible match-up to top 174 years would be a 2023 Cubs-Rangers World Series, with a Cubs-Astros series tying the record (those 1960s expansion teams have had it rough, overall). And again, that’s assuming not only that we get those very specific matchups, but also that none of those three teams win in the interim; they all seem poised to be strong for some time, and as we’ve seen, any team can get hot in October. And it wouldn’t be unheard of for one or both of these teams to have a sustained run of success after this season. Just look at the runner-up matches on that list: the Red Sox, Cardinals, and Giants all appear, and have combined for seven of the past twelve titles. All signs seem to point to this not only being a unique occurrence in baseball history, but also to it staying that way for quite a while. As you pointed out yesterday this longest combined drought is 174 combined years and the next closest was in 2005 at 129 years followed by 2004 at 106 years. So if the cubs lose the trend will continue until they finally win one!